The timing seems right to do a little recap of who I am and why I write this blog. I am Joann Sandone Reed and I live in Lake Placid, New York. 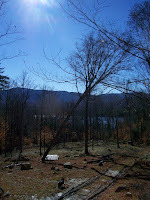 I use this blog as my pulpit from which I extol the virtues and pleasures of living, working and playing in this paradise we call the Adirondack Mountains of New York State. I made a quality of life decision 21 years ago when I moved here with my family. I currently work as a marketing consultant and real estate agent/business broker in Lake Placid. Despite the turbulence swirling in the world these days, life seems pretty solid here in the Adirondacks. Tourism is at an all-time high. The leaves are off the trees and snow is in the forecast for tonight and tomorrow (yippee!! ), right on schedule. Trees are falling on our property in preparation for the new home construction. Right on schedule. I feel a sense of stability here that I don't feel from the rest of the world. I readily admit I might be imagining things. I think the economy will eventually settle down. I think our government will right itself and the United States will get back on track, just like in the early 90s. It is my theory that I feel so calm despite the surrounding volatility because I live in the Adirondacks. I think being so tuned in to the natural environment forces me to acknowledge the innate wisdom in "this too shall change."